For 2.6Myr, glacial cycles have altered every aspect of the Earth's environment. The rapidity of climate change through regular glacial cycles drove pre-humans into new habitats and is thought to have provoked an evolutionary response that coincided with the earliest evidence of tool-making. Proxy records from the late Quaternary (approximately the past 1Myr) show that in each cycle, deglaciation was far more rapid than the onset of glacial conditions. During the most recent period of deglaciation (since the Last Glacial Maximum (LGM) ca. 17ka) two 1000-yr periods of ice-sheet retreat caused global sea level to rise at rates of ca. 1 m per century (Fairbanks, 1989), which is approximately ten times the rate of sea-level rise during the 20th century. Recent 'sea-level fingerprinting' has been used to argue that much of the rise measured for the first of these events resulted from deglaciation in Antarctica (Clark et al., 2002a). This history clearly shows us that Antarctica and similar ice sheets have had the potential to raise global sea level rapidly and to cause significant changes in the Earth System, but we should also ask if that potential still exists today? We live in an interglacial period, but despite the persistence of interglacial conditions for more than 10kyr the Earth appears to be only partially deglaciated. There are still glaciers and ice caps on every continent, and the vast ice sheets covering Greenland and Antarctica are probably still extensive compared with previous interglacials. This relative abundance of glaciers, compared with previous interglacials, results from a modern climate that is cooler than that at the height of two of the last three interglacials (Petit et al., 1999). However, these slightly cooler conditions may not continue: despite the scare stories prevalent in the media during the 1970s that predicted an imminent descent into a new glacial period ('The New Ice Age'), there is actually little evidence that our interglacial is coming to an end. Predictions based on the eccentricity in the Earth's orbit suggest that interglacial conditions could continue for a further 5-50kyr (Berger & Loutre, 2002), and what is more, there is a strong likelihood that the anthropogenic greenhouse effect may drive further widespread warming in the next few decades (IPCC, 2001): perhaps such warming will take us back to conditions in previous interglacials. Together, the abundance of glaciers and the likelihood of future warming suggest that we could be on the verge of a period of further glacial retreat; perhaps this could be widespread enough to be termed deglaciation. In fact, it is possible that such a period of deglaciation has already begun. Throughout this volume there are documented examples of dramatic glacial retreat in tropical, temperate and polar regions, and in this chapter we will add more examples from Antarctica. 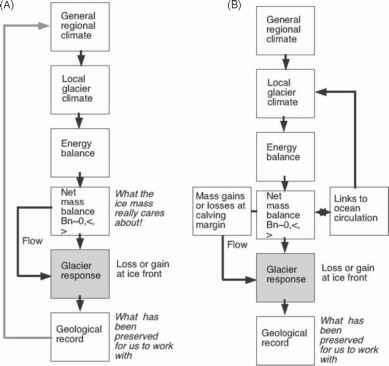 But simply cataloguing glacial change as it happens is a very poor tool with which to make predictions, and there is a clear burden on scientists to make realistic and supportable predictions for the future. Every episode of Quaternary deglaciation caused turmoil throughout the Earth System and even minor global deglaciation today would have profound economic and social consequences. For example, currently around ten million people each year suffer from coastal flooding, and accepting the best prediction of sea-level rise (ca. 44cm, Church et al., 2001a), this number is likely to increase to ca. 200 million by 2080 (DETR and The Meteorological Office, 1997). It is, however, arguable that the most potent potential contributor to sea-level rise, the Antarctic Ice Sheet, was underestimated in those predictions of sea-level rise and that any increased contribution from Antarctica would further increase the population at risk. Thus the imperative for understanding the present and future changes in the Antarctic Ice Sheet is clear. In this chapter we will review some of the reported observations of change and discuss them in terms of their likely causes, and the time-scales over which they may act. We will discuss direct and rapid changes in response to contemporary climate change and the changes that have occurred over longer time-scales; and finally, we turn to observed changes, the causes of which we do not yet understand, but which could have an impact that would eventually dwarf all others. We begin, however, with a discussion of the steady-state assumption that we apply to ice sheets and the methods of measuring deviations from the steady-state.